Chocolate Mousse Pie. I don’t know about you, but I do less baking in the summer. That is why I made this pie. It’s super easy and requires no cooking! It’s also very indulgent and can satisfy any chocolate lover’s craving! If you love chocolate, you may also like my Flourless Chocolate Muffins and my 3 Ingredient Chocoate Bars. 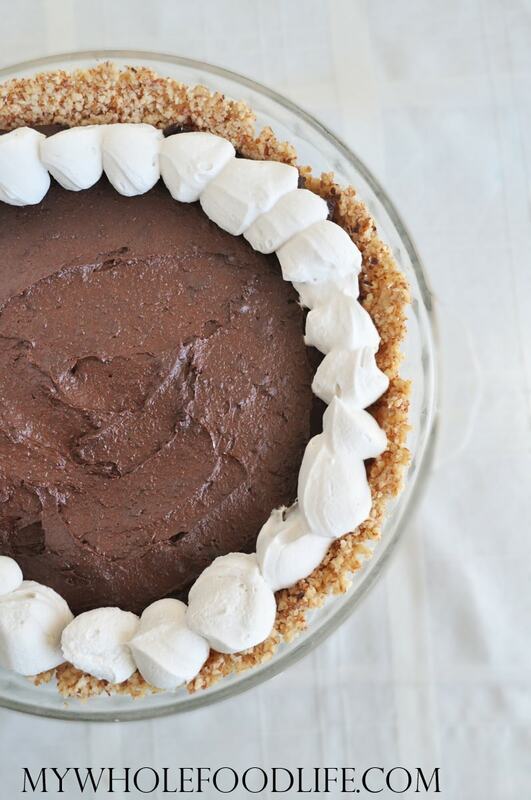 This decadent, chocolate pie is vegan, gluten free and paleo approved. I am not a huge chocolate person and I could not stop eating it! I hope you enjoy it as well. If you want to make a mousse instead of the whole pie, you can follow this easy recipe in the video below. for more videos, you can subscribe to my You Tube Channel. It's like decadent chocolate mousse in pie form! In a food processor , combine all the crust ingredients for about 2 minutes. Once a loose dough forms, press it into a greased pie pan . The mixture will seem a bit crumbly, but it will firm up nice. Place the pie pan in the fridge to chill. While that is chilling, drain the dates and place them into the food processor with the avocado. Process for a minute or two to get those broken down. Then add the remaining chocolate ingredients and process until smooth. Pour the chocolate mixture into the pie dish and set in the fridge to chill. Open the can of full fat coconut milk that has been refrigerated. Scoop off the solid white part and place into a mixing bowl . You can save the remaining liquid for smoothies. Add the maple syrup to the coconut. Using a whipping attachment, whip the coconut into a cream. Once you have a coconut whip cream, scoop everything into a plastic bag. Snip off one tiny corner of the zip-lock bag and use that to slowly pipe the cream onto the pie. If you want to be a little lazy, you could also spread the coconut cream over the whole top instead of piping. Set the pie back into the fridge for another few minutes. Enjoy! This should last about 4 days in the fridge. I haven't tried freezing it, but that might be an option. Please let me know if you try! Love all the ingredients in this pie! Approx how long will this keep in the fridge before the avocado goes bad? Thanks! I think it should keep for at least 4 days. You might be able to freeze it too, although I haven't tried. I love your site but like so many others, the ads are super annoying. I can deal begrudgingly with the ones on the top and sides but the new style where they pop up at the bottom when using your phone are too much. It covers a lot and makes it near impossible to pin something. It says half the time no pinnable images. And you can't close out of them. This looks so delicious!!! About how much almond flour would you suggest in place of the 1 1/4 cups of raw almonds? Maybe 3/4 cup or scant cup? I'm gonna try it out tonight!! If I had to guess, I would say about 3/4 cup. Let me know how it works with almond flour. I have a ton of pecans that I gathered in the fall and froze. Do you think I could sub the almonds in the crust for pecans? Wondering if it would work the same.. I've seen various sizes of dates ... would you estimate about a cup and a half? Thanks!